Cheim & Read is pleased to announce an exhibition of recent work by London-based artist Paul Morrison. Morrison is best known for boldly graphic, black-and-white landscape paintings, wall drawings, sculpture and animations. His work incorporates found imagery culled from various pictorial genres and different time periods, such as Disney cartoons, early botanical illustrations, and Northern Renaissance woodcuts. The current exhibition introduces several canvases which use gold-leaf as ground. The paintings' metallic surfaces reflect light, and further manipulate the viewer's experience of the picture; gold references art historical precedents, and is reminiscent of Early Renaissance religious painting. Also exhibited at Cheim & Read is an animated film collage, Sporangia, 2008. Like his paintings, Morrison's films are assemblages of images from his extensive collection, but the different medium provides additional focus on movement, light and shadow. Morrison's compositions are the result of an intensive and detailed process which rethinks spatial and historical juxtapositions. He manipulates his selected source imagery, removing color and editing detail; separate images are then collaged to create an original composition. The final image is projected on canvas (or, for site-specific murals, directly on the wall) and painted in two coats of black acrylic. Often large-scale, Morrison's work reinterprets the physical space in which it is shown. Oversized sculpture (like Mericarp, 2008, a 10-foot dandelion made of galvanized steel and aluminum), and high-contrast, floor-to-ceiling wall drawings position the viewer within a fantastical landscape. Morrison creates shifting sensations of scale and space, and allows for associative interpretations of the various stylistic constructions of his imagery. Morrison was born in Liverpool in 1966 and graduated from Goldsmith's College in 1998. His first one-person show was in London in 1996. 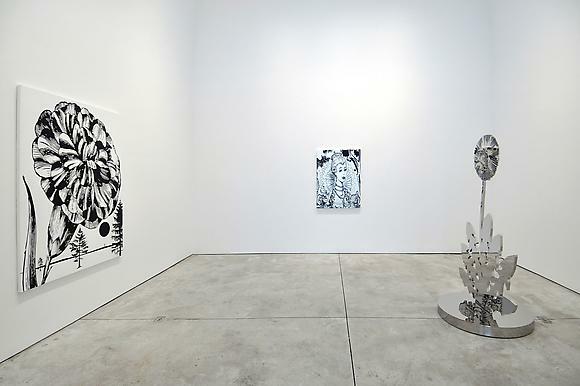 Cheim & Read's previous exhibition with Morrison was in 2004; it was also his first solo show in New York. Morrison currently lives and works in Sheffield and London. His work has been subject of several recent museum exhibitions, including shows at Las Vegas Art Museum, Nevada (2008), Bloomberg Space, London (2007) and The Contemporary Museum, Honolulu, Hawaii (2006); he has also shown at IMMA, Dublin, the Hammer Museum, Los Angeles, and Magasin, Grenoble. The show at Cheim & Read coincides with an exhibition, PAUL MORRISON, CALATHIDIUM, at the Horticultural Society of New York, February 13 – March 18, 2009 (opening reception Friday, February 13th from 6:00 to 8:30pm). The exhibition, curated by Jodie Vicenta Jacobson, will consist of ten black and white screenprints created by Morrison at Paragon Press, London. 'Calathidium' is a botanical term referring to flowerheads, of which several different species are represented. The Horticultural Society of New York gallery is located at 148 West 37th Street, 13th Floor, between Broadway and Seventh Avenue, New York. The gallery is open Monday to Friday from 10am – 6pm and by appointment. For further information please call 212.757.0915 x113 or visit www.hsny.org.